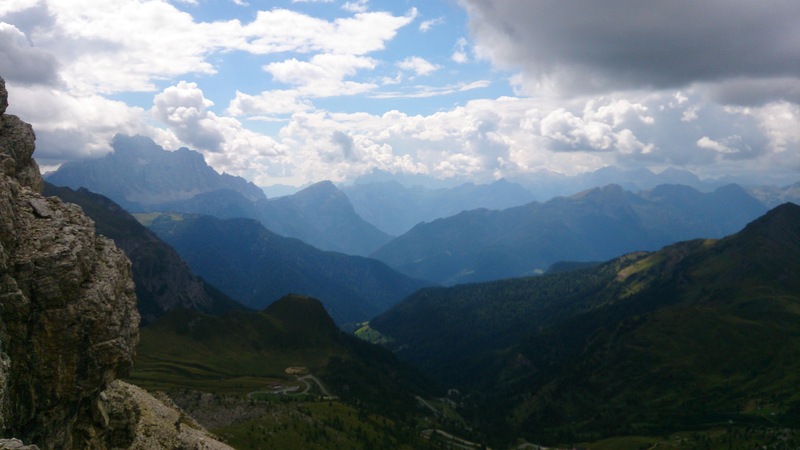 Again under the forecast of 100% chance of rain, we headed off from Cortina d’Ampezzo after our lovely rest day. We bused it out again to the point where we left the track two days earlier and made our way back up into the mountains. It was a relatively short day and against the weather odds, it was again beautifully sunny (albeit with thunder clouds building around the peaks. 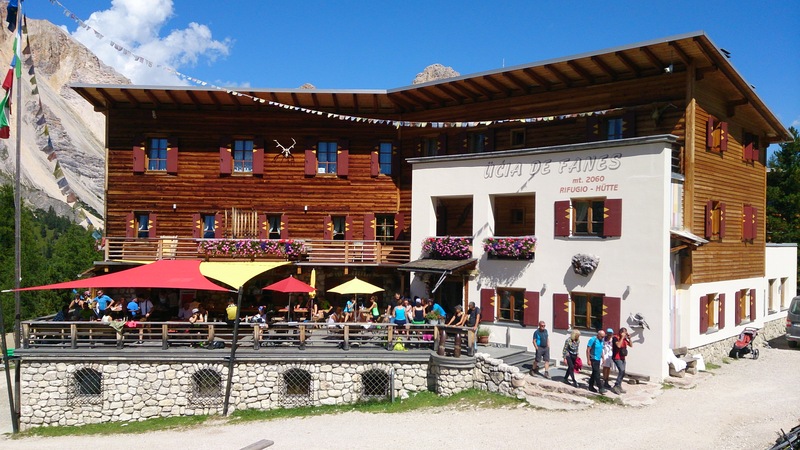 Our destination today was the oldest alpine hut in the Dolomites. 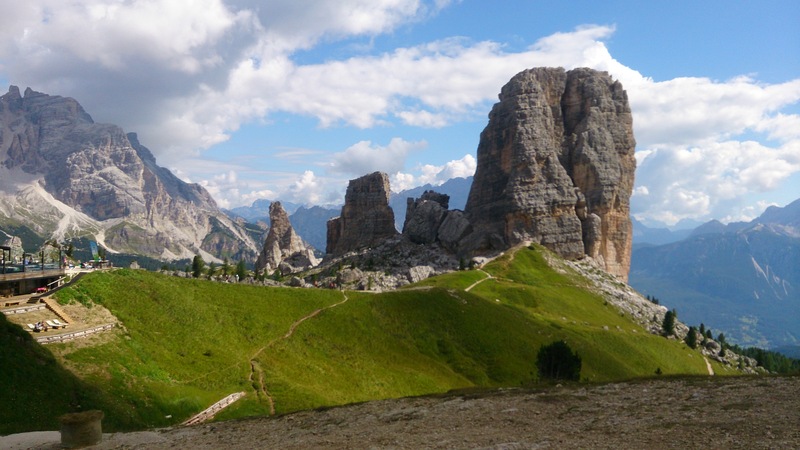 A German man in the 1800’s came to Cortina to try to beat tuberculosis and after his recovery, set himself the challenge to walk up Novalau mountain. 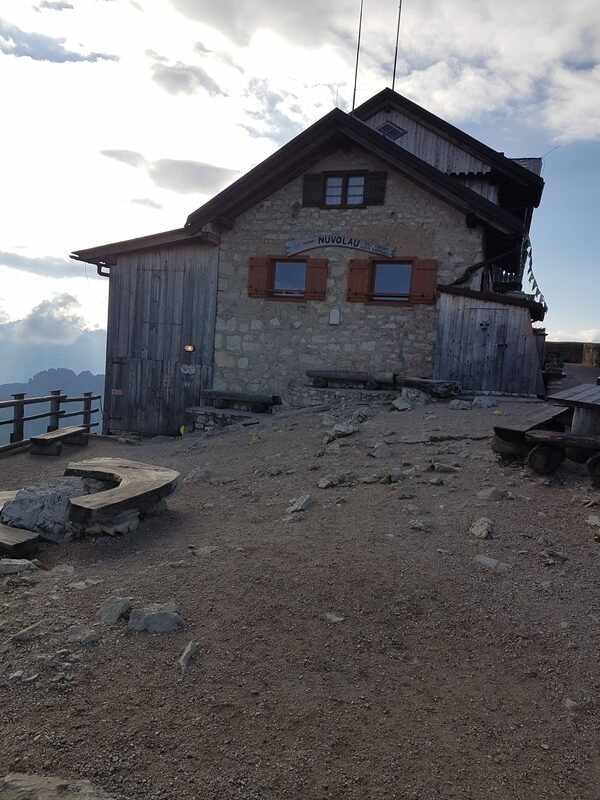 As a thank you for his recovery he decided to build a hut on the top of Novalau in 1883 as a safe place for local walkers, skiers and mountaineers and so was born Rifugio Novalau. There is also a story that the hut was able to avoid being bombed in the war even though it was a head quarters for the Italians because it just so happened that the German pilot sent on the bombing mission was the nephew of the man who built it. It was a funny old place with lots of hand written signs up on the walls forbidding one thing or another. We couldn’t understand the Italian of course, but we asked about one and were told that it said it is forbidden to take your clothes off in the bar! Apparently people sweating from the climb up were prone to stripping off articles of clothing and hanging them around the place to dry. Being at the very top of a craggy mountain meant they also had no water except what is painstakingly pumped up each day, so no showers and no rinsing out of sweaty clothes! And being so old they had squat toilets. The dorm rooms were tiny. There was about 90 cm between the double bunk beds. And they were totally full. So needless to say Rod was not feeling very comfortable. But it was a great experience and the view from there, although we were engulfed in thunder clouds at times, was probably the best so far. We headed off under the threat of rain this morning. Not that it worried us too much initially as we started the day with a 1100 m climb down through the Italian World War 1 tunnels. What a feat of engineering! The tunnels took us too far down for our remaining route so we climbed again to the pass before having a relatively easy walk to the targetted rifugio for the day. But we weren’t staying there. 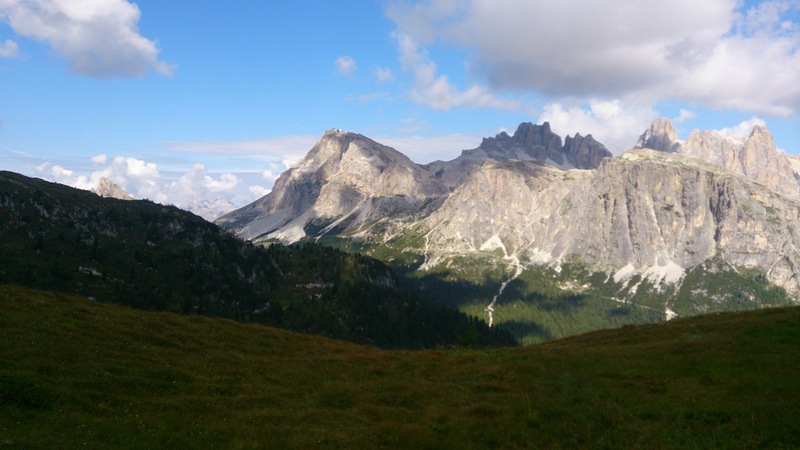 We’d organised to have a rest day in the nearby town Cortina d’Ampezzo. So we dropped down steeply all the way to the valley floor and caught a bus to cover the 30 minute ride into town. Luxury! I’m going to enjoy a good sleep after the various snorers in the dorm last night. Cortina is a beautiful little town. The notes had us a bit worried. They described a section of the walk today as being particularly dangerous and the hardest part of the whole Alta Via Walk. We thought we were up for it however until we spoke to an American woman who asked if we had harnesses and tethers! The notes also said to take the alternative route if there was recent heavy rain – and guess what, it rained last night! We were starting to get a bit windy about the idea. Luckily just at the point where we had to choose one route or the other we came across a group with an English speaking guide. We asked if last night’s rain was considered “heavy” and he said no, and also that harnesses were not required. Phew! So up we went. Or more importantly, down the other side we went! The track down was over a massive unstable landslide and very steep. The views were some of the best so far across to a distant glacier. None of my pictures do the view any credit. We continued walking on to our rifugio for the night. 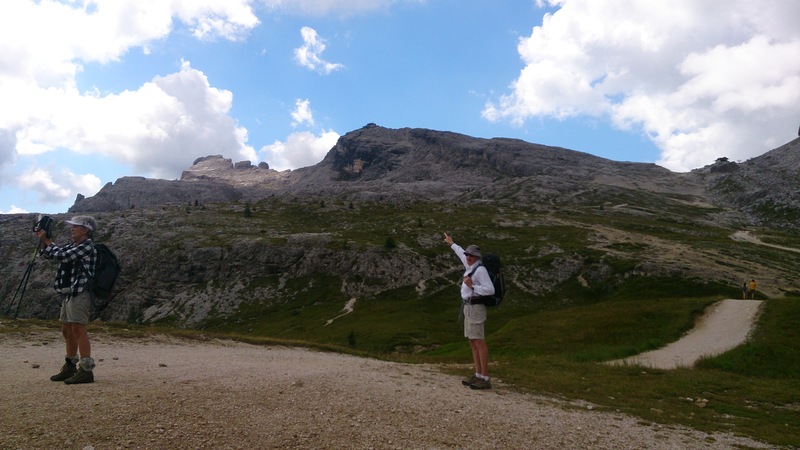 As we gained height again we entered a vast area that featured in the high alpine battles in World War 1 between the Italians and the Austrian/Hungarian forces – the Lagazuoi mountain and surrounds. In 1917 the Austro-Hungarian forces held the high ridge and had tunneled their way into the rock to develop fortifications, machine gun posts,, and to shelter from the -25 degree winter weather. 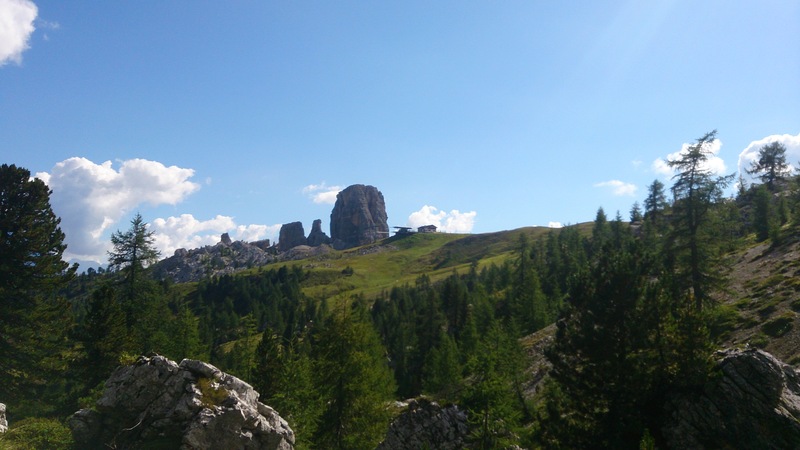 The Italians held the lower ledge – Martini Ledge, and tunneled their way up through the rock (1100 m) to surprise the Austrians at the top. Altogether the Italians dug out a total of 10,426 tonnes of rock in only four and a half months averaging a net advance of 5.58m every 24 hours. They eventually overcame the Austrians who were weakened by lack of food and the cold. 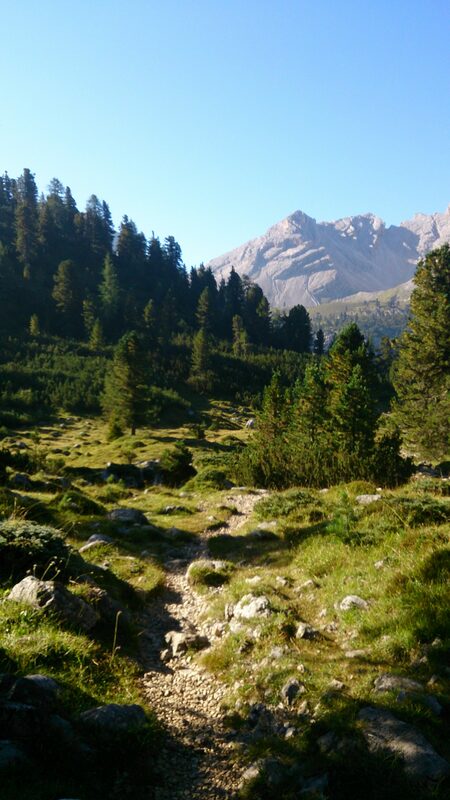 We were able to freely crawl around the Austrian caves and tunnels at the top as we passed up to the rifugio. 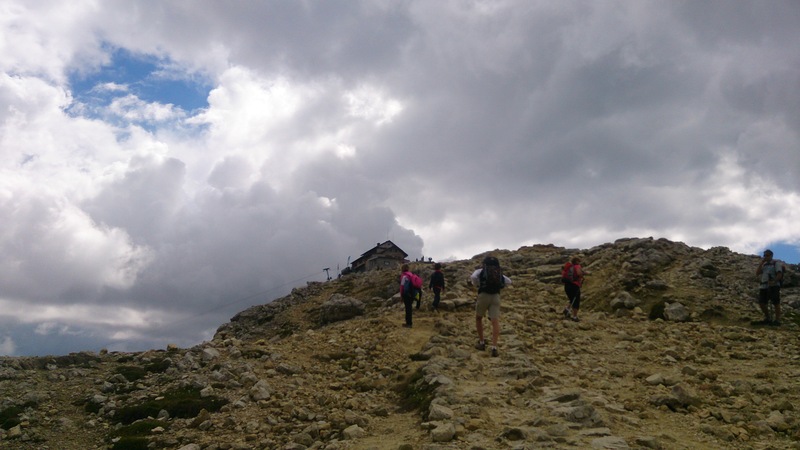 We experienced the first rain just as we reached the rifugio for the night. 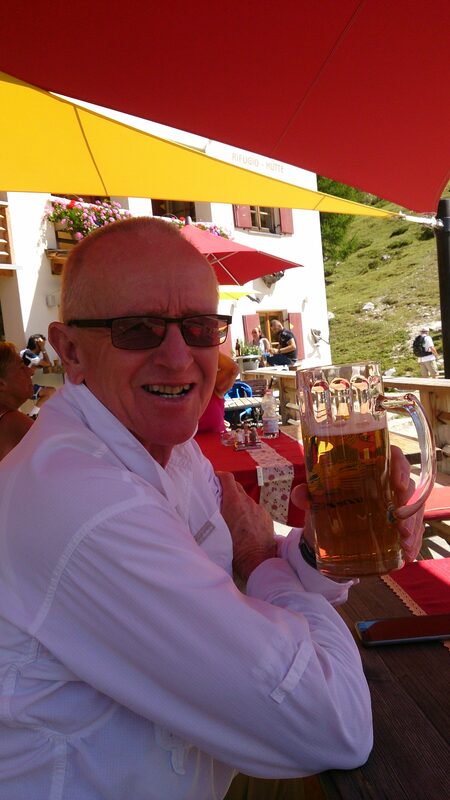 Rod had his first experience of sleeping in a dorm with 20 other walkers – not something he took to well. Today promised to be an easy day and it was in Alta Via 1 terms. Only 580 total height loss (all in the first 4 kms) and 530 total height gain (all in the last 5.5 kms) Yes that’s right only 9.5kms for the day. It feels like the adventure has really started now. We’ve made the big hop to Munich and successfully managed to get ourselves onto the train to Dobbiaco in Italy, the starting point for our walk. Rod was temporarily distracted at the Munich airport where he introduced himself to Jessica Fox, Bronze medalist in kayaking at Rio Olympics. He of course asked for a photo. What a sporting groupie! I accidentally had the forethought to book us first class tickets on the train which entitled us to wait in the Munich Haufbanhoff catered Lounge for the four hours after the plane landed. Very civilized. I’m amazed actually. I bought the train tickets on the German DB website and everything was written in German. Also the last leg of the journey was on an Italian regional train where it wasn’t possible to buy the tickets in advance. Even the two connections that only allowed 6 minutes to change trains worked out! Germany is very green and the last blooms of summer abound. I made the mistake of commenting to Rod within earshot of a German woman as we came in from the airport that the countryside looked a lot like the UK. She firmly disputed this thought and only pleading my Antipodean ignorance got me out of that one. We passed a couple of breweries on the route out of the Bavarian region and all seemed to be flat out preparing for the upcoming Oktoberfest. Within 20 minutes of leaving Munich station we were amongst the iconic Bavarian villages with their distinctive barns and church steeples. 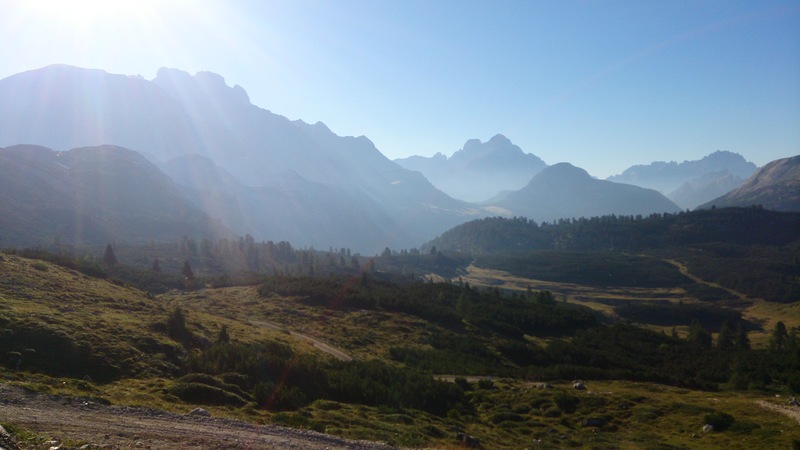 The scenery through the alps to reach Dobbiaco was spectacular! The town itself is super expensive and alive with summer holiday makers. Looks like it is huge for skiing too in winter. Only one more sleep now. Posted on August 20, 2016 | Comments Off on Off again! Getting excited! Last few days before we head off on our next adventure. I hope I’m up to the 1000m climbs into the mountains each day. First challenge however is how to close my pack!!! Comments Off on Off again!